Originated in South America with the name Cherimoya, Custard apple is also known by various other names like sitaphal, sharifa and sugar apple. The fruit is named after the custard like texture of the flesh of the fruit. Custard-apple is scented, its taste is very sweet. It is sweet with a reasonable level and doesn’t cause greasy feeling in eating, so many people like to eat it especially women; however, this sweet taste and rounded figure are reasons that make body of people that like to eat it hot. Custard apple is not only lovely, nutritious and delicious seasonal fruit but also act as a miracle fruit during pregnancy. An expecting mother is often prescribed to have this fruit on a regular course as it is a very rich source of all kinds of nutrients. It has high nutritional benefits. It is packed with vitamins, minerals, protein, fibre, carbohydrates and essential fats. The natural sugars in them help underweight pregnant women gain weight. It lowers the risk of abortion. You will also find it palatable when you develop a distaste for others foods, a common tendency during pregnancy. Custard apple helps to cope with morning sickness and mood swings that is often faced during pregnancy. It also reduces the risk of miscarriage and eases labour pain. This wonder fruit also contributes in the development of the brain, nervous and immune systems of the foetus. The fruit is sweet, delicious and absolutely safe to consume during your pregnancy. Custard apples are known to be enriched with Vitamin C, which helps to combat the free radicals in the body. The fruit is also rich in Copper which is a trace material which helps the body to form haemoglobin. The lack of copper in a women’s body can result in premature birth of her child. Apart from this the copper deficiency can cause in a low white blood cells. When an average person would require around nine hundred micro grams of copper per day a pregnant lady will need about round thirteen hundred micro grams of copper. The benefits of custard apple also include the fact that it contains Vitamin A which is a good source of good vision, hair and skin. 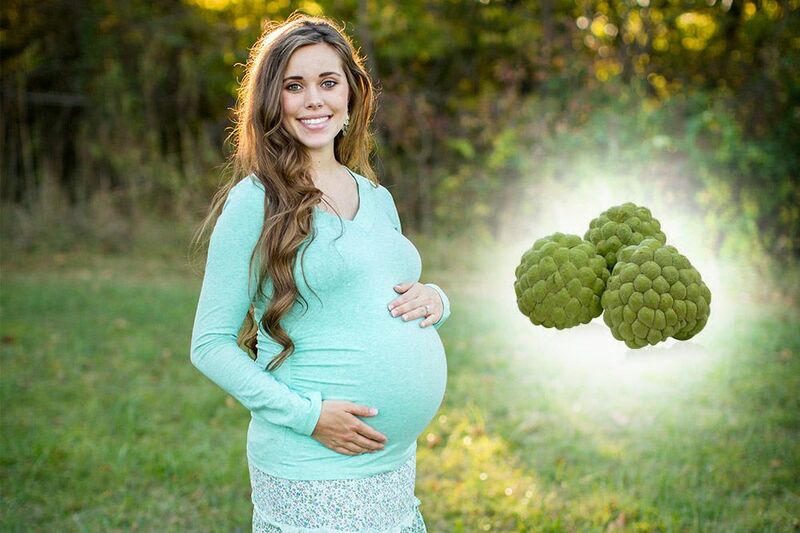 Custard apples are rich in magnesium, again very essential for pregnant ladies as it helps them to guard us from cardiac issues and it can also relax the muscles. Custard apple is higher in calories, when compared to other fruits. However, they certainly make an ideal choice for the expecting mothers who require those extra calories for their existing physical condition. The high fiber amount of custard apple helps them in fighting with constipation, which is a common condition for many pregnant women. It has been found that custard apple is quite effective in reducing labor pain. This fruit has also been found to lower the risks associated with miscarriage. Custard apple is loaded with fiber that helps to normalize bowel movements and reduces the constipation issues that pregnant women commonly face during this period.